Bind up the wounds of thy children O God, and help us, following the example of thy servants Damien and Marianne, to be bold and loving in service to all who are shunned for the diseases they suffer, that thy grace may be poured forth upon all; through Jesus Christ, who with thee and the Holy Ghost liveth and reigneth, one God, for ever and ever. Amen. Bind up the wounds of your children, O God, and help us, following the example of your servants Damien and Marianne, to be bold and loving in service to all who are shunned for the diseases they suffer, that your grace may be poured forth upon all; through Jesus Christ, who with you and the Holy Spirit lives and reigns, one God, for ever and ever. Amen. In the 1800's, the Hawaiian Islands suffered a severe leprosy epidemic, which was dealt with largely by isolating lepers on the island of Molokai. They were simply dumped there and left to fend for themselves. The crews of the boats carrying them there were afraid to land, so they simply came in close and forced the lepers to jump overboard and scramble through the surf as best they could. Ashore, they found no law and no organized society, simply desperate persons waiting for death. 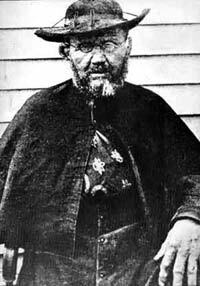 A Belgian missionary priest, Joseph Van Veuster (Damien of the Fathers of the Sacred Heart), born in 1840, came to Hawaii in 1863, and in 1873 was sent at his own request to Molokai to work among the lepers. He organized burial details and funeral services, so that death might have some dignity. He taught the people how to grow crops and feed themselves better. He organized a choir, and got persons to sing who had not sung in years. He gave them medical attention. (Government doctors had been making regular visits, but they were afraid of contagion, and would not come close to the patients. They inspected their sores from a distance and then left medicines on a table and fled. Damien personally washed and anointed and bandaged their sores.) There was already a small chapel on the island. It proved too small, and with the aid of patients he built a larger one, which soon overflowed every Sunday. Damien contracted leprosy himself in 1885, and continued to work there until his death on 15 April 1889. 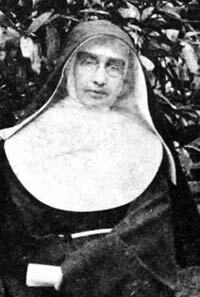 Mother Marianne Cope (January 23, 1838 – August 9, 1918), was a Franciscan nun of the Sisters of the Third Order of Saint Francis, a religious order of the Roman Catholic Church. Born in Heppenheim (Germany) and entered religious life in Syracuse, New York, she worked, lived and died for the lepers on the island of Moloka'i in Hawai'i. She was not herself afflicted by the disease, a fact arguably declared to be miraculous considering her close contact with the patients over the course of several years. At the age of three her family moved from Germany to the United States, settling in Utica, New York. After joining the Franciscans, she spent nearly a decade as a teacher and then principal in newly established schools for German immigrants. She was also a founding member of two of the first Catholic hospitals in the United States. In November 1883, Mother Marianne, then Provincial Mother, traveled from Syracuse to Honolulu with six other nuns to answer a call for aid to the Hansen's disease sufferers. In 1888, she moved to Kalaupapa to help the ailing Father Damien of Moloka'i. When the famed priest died, Mother Marianne Cope took over the care of the patients of Kalaupapa. She remained there until her death in 1918.